First off we need to state that we are saddened, and we take no pleasure in seeing events like yesterday’s unfold. 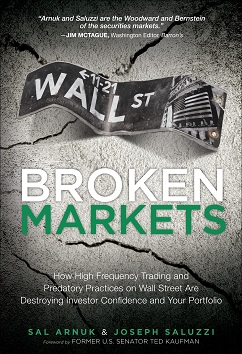 Thousands of really good people at Knight, NYSE, NASDAQ, Goldman, and countless other industry firms – including ours, have been/are/will be adversely harmed by these continued market structure and trading glitches that demonstrate a broken market. All of us within the industry and outside of it are harmed. A black eye on NASDAQ or BATS or Knight is a black eye for all of us. We all prosper when investors are confident and eagerly participating in the investment function, and we are hurt by the inverse. Technological glitches will always be a certainty, but a structure that can handle them better is what is desperately needed and what we all strive for. Yesterday morning, as you are all aware, “curious trading” created high-volume price moves in nearly 150 stocks, including well known big name large caps like AA, AMD, AMTD, AXP, BAC, BBY, BUD, CAT, DD, GM, GT, HUM, JNPR, KR, LSI, NOK, PEP, as well as in more obscure preferred stocks such as JWF – a Wells Fargo preferred stock that rarely trades. The price moves ranged from five to thirty percent, and the curious trading lasted nearly forty five minutes. At the time of the curious trading, the immediate speculation in the financial media was that there was a “fat finger human error”. Pundits proclaimed it was a $4billion notional value program that was entered as a 4 billion share program. Yet others rumored that it was a program that humans entered into the market that was supposed to be spread over 5 days – and not minutes. Chart Courtesy of KidDynamite and his blog which we link to later in this note. We knew that this was a high frequency market maker issue from the onset; one could see the Bloomberg advertisements of the offending market maker auto-accumulating (those advertisements have subsequently been removed from Bloomberg). We watched firsthand how it appeared that the offending market maker algo crossed the spread and hit bids no matter how low they were placed, nor how wide the spread was. We guessed that the market maker, in making changes to its automated program to somehow interact with the brand new NYSE RLP pilot program, somehow reversed the logic in their program. We wondered if it could be possible that that the prop trading market maker algo 1) sensed direction (this is nothing new- it is integral to their market making) and 2) entered offers when it thought it was entering bids, and vice versa. We wondered if the market making program ran for over 45 minutes because it thought it was buying on the bid, collecting rebates, and flipping out quickly with low risk, while in actuality it was selling on the bid, and then selling again – compounding its errors. The reality is that only the market maker itself will know. The rest of us are just guessing, really. Later in the day Knight Capital acknowledged that the error was theirs and that their automated market making had flooded the markets with millions of trades. Knight is one of only four DMMs on the floor of the NYSE (or Mahwah) that control the lion’s share of all NYSE trading; the others are Goldman Sachs, Getco, and Barclays. The “technology event” has stirred much debate. In more than a few interviews yesterday we have stated that these types of events harm investor confidence, as increasingly investors are witnessing issues caused by the plumbing of our markets – our foundation – that cause asset prices to deviate substantially from their true values. The New York Times also reported that Flood of Errant Trades Is a Black Eye for Wall Street. Bloomberg reported about Knight’s Bruising. And ZeroHedge wrote, with the aid of Nanex, that This is What Happens When an HFT Algo Goes Totally Berserk. Taking the other side of our argument were a few influential bloggers, one of which who wrote that the market has proven to be robust. The massive price moves – some over 30% – and reversion, were proof that our markets work perfectly, as price dislocations of these trades were met with reasoned contra sides that made money. – Our markets are not a casino. While we have absolutely no issue with professionals choosing to enter a casino, and using their own money like testosterone chips to play games of chance, bluff, and risk, our markets are supposed to be a superhighway upon which all investors and traders, no matter their time horizons, can travel safely and freely, with the same rules for everyone. – The technology and algo wars of recent times (post REG NMS) are not born out of desires to make trading more efficient for everyone, they are born out for-profit actions from conflicted interests who helped create the rules. Instead of technology being leveraged to bring ultimate buyers and sellers together, the technology has been leveraged to maximize insertion of highly armed and proficient intermediaries between natural buyers and sellers. This is why internalization by major broker dealers has become such a profit center, and why the NYSE has adopted its own can’t-beat-em-join-em RLP program. This is why payment-for-order-flow practices dominate our market structure – internalization as well as the maker taker model. The algo wars of today are all about the financial modeling/ weeding out the dumb order flow from the smart order flow – in order to disadvantaging it – on one hand, and a video game of pick-up-the-rebates on the other. What ever happened to pricing being about demand versus supply – where the best priced bids always interact equally with the best priced offers – AND TRADE. – If our markets remain so toxic that only professionals who can understand the complex market structure and invest in specialized tools, and who watch these same markets every minute of the day, get to benefit, then our capital super highway will see more investor equity outflows, and will continue to increasingly be divorced from true supply and demand metrics – which are at the core of efficient markets since the beginning of time. – Regulators may try to “monitor algos” – but the reality is they will never be able to stop a derailing. Heck – Knight took over 30 minutes to stop itself. The exchanges took over 6 hours to decide which trades to cancel. Can a regulator perform more quickly? This is doubtful. Rather, if the SEC wants to fix our Broken Markets they must fix the foundation. They must eliminate payment for order flow at all levels – including order flow internalization and the maker taker model! Would this increase spreads? Maybe. Maybe by a penny. The ramp up of conflicted practices by the industry has certainly not meaningfully decreased spreads – they remain close to 2006 levels! The bottom line – would a slightly slower market place with $20 retail commissions and 2 or 3 penny spreads, and yet void of conflicts of interest, and where true buy and sell interest dominated pricing instead of rebate maker-taker video games… would that be a really bad thing? Would such a market be worth getting investor confidence back, and hundreds of billions of investor dollars back into the market? Is the risk of flash crashes, and algo-dominated systemic trading risk caused by uneven trading rules, really worth the meaningless price improvement constantly touted by the industry? The time is now for our regulators to stop looking into issues and start acting on them. ← HFT’s Locating Their Servers Now In The Middle Of The Ocean?